This painting was created for use on a 1937 calendar by Hy Hintermeister, as the second in the Shaw Barton Calendar Co. series, "The Great Adventure". 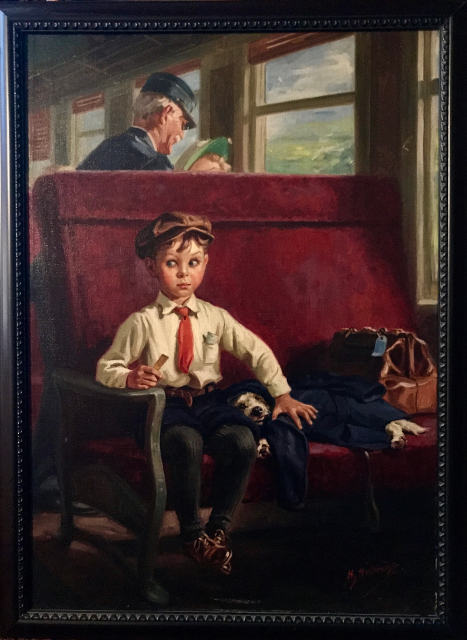 The young boy seen here is traveling with his dog to his grandfather's farm for the summer. He is nervously attempting to hide his dog from the view of the train's conductor. The painting is titled, "Anxious Moments".